Many of the links are duplicates that go to the same image. 3rd Marine operation Starlite. BS6792? Site of first significant action by Americans in area August 17-19 1965 (573 CKIA enemy vs 46 Americans). Southwest of Tam Ky Approximately BT3015? (Div Arty ORL BT 063 470) (named after 4th Inf Div unit nicknamed "Blue Cacti" in Task Force Oregon) (Also listed at AT055470 in Frederick Hill COARS). High up in the mountains lots of down drafts. West of Duc Pho. Bad to fly into during monsoon. BS448612? (Div Arty ORLL BS450612 and BS448612) Supported Iron Mountain and Vernon Lake II operations. eleven miles west of Tam Ky. BT132203 (DivArty ORLL BT13102025) (BT131203 Fred Hill COARS).? Named after 1-1 Cav ditty. BT215437. Turned over to ARVN troops, then lost by ARVN forces and re-taken by US troops several times. Set up in January 1969 as part of Operation Hardin Falls. East of LZ Baldy. 2-1 Infantry re-established it 16 January 1971. North of Dragon Valley. (COARS Frederick Hill BT185?74). named after 4th Infantry Colonel Kimmel's wife (He was killed in Vietnam). Northwest of LZ professional. Opened up with a 10,000 lb daisy cutter around August 1970? In Que Son Valley. AT804184 or AT805184 blocked infiltration route from Kham Duc. (DivArty ORLL AT805183) AT803181 by Frederick Hill COAR. ZC 1801344 by Frederick Hill COARs. Americal artillery working in 4th Division AO. Twenty miles northwest of Chu Lai. BT176070 (Div Arty ORLL BT173076) (John Wills visited here March 1995. He believes the coordinates are wrong. Upper part of hill has eroded and placed about two feet of mud on helipads. Top of hill is much smaller than before. Area had been scavenged. All he could find were old sandbags. 1/46 Inf left 22 Aug 70 and base was closed. (Frederick Hill COAR BT172078). Hill 411 is West of Quang Ngai City along Song Tra Khuc river. Used by the Marines in 68 and later used by the Army during Oper. Dewey Canyon II-Lam Son 719. This LZ was later renamed LZ Vandergrift and was used as the jumping off point for the operation that lifted the siege of Khe Sanh. Was 196th Brigade headquarters. Nineteen miles west of Tam Ky. (The mountain is known as the mountain of leeches to the Vietnamese). LZ Karen was just the next hill west of LZ West. Four or Five miles west of Tam Ky. Really bad place to go in 1968. Was area near NVA Divisional headquarters at one time. BT182146 ??BT188168?? 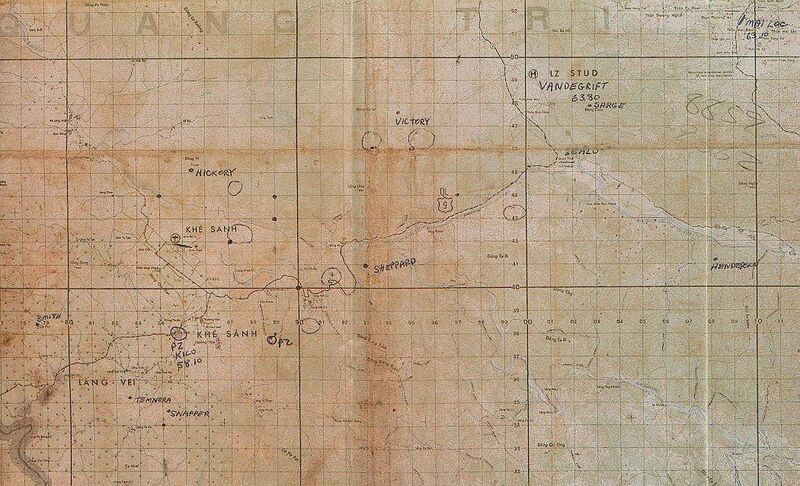 (DIVARTY ORLL BT188157 and BT187155) (BT188157 Fred HillCOAR report) NVA division headquarters found 22 miles west of Duc Pho. 3. Courtesy of Frank Jodaitis. From "Operational Report- Lessons Learned, Headquarters, 3rd Brigade 4th Infantry Division, Period Ending 30 April 1968.